The massive, toxic algae bloom currently swirling around the peninsula of Florida has its origins in an ongoing cycle of political manipulations, kickbacks, loosening of environmental and water regulations, an aging water-transfer infrastructure in and around Lake Okeechobee, and a Governor in the pocket of Big Sugar. It all adds up to one vicious chain, and guess who gets to foot the bill? Cartoon by Ed Hall. 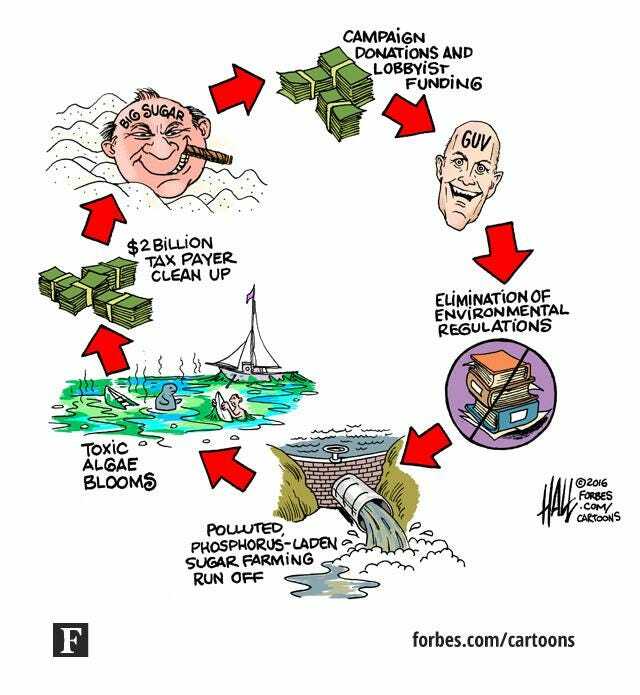 Forbes cartoon with cutline about how Florida political corruption caused our environmental crisis. If you love your country and want to preserve and protect democracy and our environment: Vote against RICHARD LYNN SCOTT and support Democratic U.S. Senator Bill Nelson. Footnote: Ed Hall was wrongfully fired by MORRIS COMMUNICATIONS and The St. Augustine Record in retaliation for a funny cartoon about Flori-DUH school superintendents cutting back on art and music and athletics. The 2008 firing the firing was at the behest of Cultural Council President PHIL McDANIEL and then St. Johns County School Superintendent Joseph Joyner's entourage of joyless humorless apparatchiks. These pompous poohbals were driving under the inference that the cartoon was about Superintendent Joyner, and PHIL McDANIEL a/k/a "PHIL THE SHILL" published a column in the Record the the cartoonist needed to do "better research." In fact, the cartoon was about a fungible School Superintendent. But that did not keep the Republican machine from flexing its muscle to fire a cartoonist. McDANIEL later contacted me and asked me to remove mention of his sins against the First Amendment because it was adversely impacting his "image." I declined. Hint: ten years later, it's time for GateHouse, the new owners of the Record to rehire Ed Hall.